Peoples' Democratic Party (HDP) Hakkari MP and Democratic Society Congress (DTK) Co-Chair Leyla Güven is on the 96th day of her hunger strike, which she is conducting against the isolation on PKK's (Kurdistan Workers' Party) imprisoned leader Abdullah Öcalan. 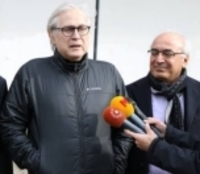 Human Rights Association (İHD) Co-Chair Öztürk Türkdoğan, journalist Ali Bayramoğlu and 78's Initiative Spokesperson Celalettin Can visited Güven at her home yesterday (February 10). All three were members of the "Wise People" group, which was formed in the resolution process in 2013. Türkdoğan, Bayramoğlu and Can talked to the journalists after the visit, the Mezopotamya Agency reported. "The law on executions are clear and should be applied equally to all people. Strict visit bans and strict isolation should not be applied on any convict and arrestee in Turkey. "As a human rights defender, I mention this on every occasion. We remind this to the government and state authorities. If this is a state of law, everyone should abide by the laws." Türkdoğan added that they talked with the Ministry of Justice on the issue and they want to meet with the President and Justice and Development Party (AKP) Chair Recep Tayyip Erdoğan as well. Journalist Bayramoğlu: "Unawareness and insensitivity"
Journalist Bayramoğlu said, "An MP of an important political party has been committing her life and body for her beliefs or some political demands for three months. In this country and climate, there is a state of unawareness, insensitivity and absence of conscience." "If a person commits her body and life, it is impossible to not respect her. So I am here because I respect her" Bayramoğlu added. "There is not enough sensitivity among public and the government for Leyla Güven. "Güven's hunger strike is becoming a protest against the isolation of the whole society, not just the isolation of Öcalan. "Deaths can happen in prisons. While we are heading to elections (March 31 local elections) and Turkey is trying to make up for its democracy deficit, 300 people are on hunger strikes. When it becomes serious, we will live it together. "I do not think the hunger strikes Leyla Güven started will be limited to 303 people. There will be more participation. Even if we do not want, maybe there will be deaths."